My father recently passed away and I have a question regarding a cell tower that's on our property. 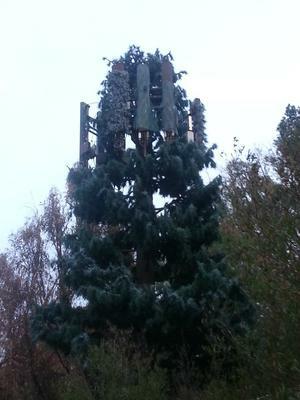 This cell tower showed up out of nowhere a few years ago. I spoke with my dad about it before he passed and he was upset about it and fired off a letter to the county but never heard back. He was looking into how the cell tower got there in the first place but he passed away before he could make any progress. A few things to note that complicate this situation. We live in Orange County CA. However we live in whats called the unincorporated area of Orange county. Technically the house is assigned a Santa Ana zip code but ultimately there's no city jurisdiction as far as I know. Secondly, this land is our property but it's near a road and constitutes an easement. So my question is, can the county just place cell towers at will on private property, albeit private property with an easement? Any help would be appreciated. Thanks. The cell tower is labeled as At&t Mobility. It's also not showing on any online search sites for tower location lookups. Need to take a closer look. Is it another fake government cell tower or an actual bona-fide cell tower built within their rights? Although I'm sure the Alex Jones Radio show would eat this story up... before that happens we really need to see what the Easement says and see if the folks at AT&T are within their rights or not. Also need to see what regulations the county has written into their ordinance regarding right of ways and telecommunications tower development. Is the tower encroaching on your property and outside of their designated easement area? You should be able to walk down to the building department and ask to see the file on this. You may need to fill out a FOIA form (freedom of information act) and wait a few days to see what sort of information is documented on file, and that can give you an idea of what (if any) approval process took place and how the tower got there. Also the free online tower databases are not 100% accurate by far, so don't be surprised that nothing showed up when you searched. Please reach out to us here at Tower Genius to discuss after you've gathered more information.